When you peruse our shop, you might found out that the lamp you're looking at belonged to a lawyer for the Nuremberg Trials who was transported to the United States before World War II. You might find an original, commissioned oil painting hanging on our walls of a prominent and wealthy theatre family here in Denver; for which a DCPA theatre is named for. You might discover an engraved silver platter proclaiming the eternal love for a couple that lasted sixty years or a you might find a hand-crocheted tablecloth fashioned to look like someone's favorite flowers. Everything in our store has a story. Cobblestone Too! is no different, it too has a story. Cobblestone Too! began as a sister store to the original Cobblestone on 44th Ave and Wadsworth in the Wheat Ridge area. 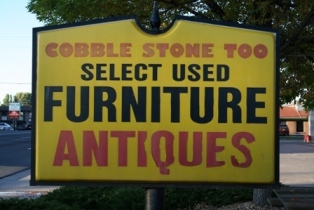 Both stores were owned by MaryAnn Montonati, a self-driven Italian woman who founded Cobblestone in the Denver area some 25 years ago with her love of antiques. She formed Cobblestone and made it successful, eventually opening Cobblestone Too! around 1994. Though the Cobblestone original location on 44th and Wadsworth has closed down, the sister store continues to run strong. About 15 years ago, a young man worked for MaryAnn for about 5 years by the name of Kyle Koster. Kyle learned all he could from MaryAnn before leaving for the corporate world. However, he never felt at home in the hustle and bustle of office life and always missed the customers and the business of Cobblestone. About two years ago, Kyle returned to Cobblestone with the intent of purchasing MaryAnn's business from her and keeping the family name running. And that brings our story to today. MaryAnn can still be found at the store, working alongside the general manager Kyle as the Cobblestone crew continues to bring the best in antiques, art, and furniture to the Denver-Metro area.